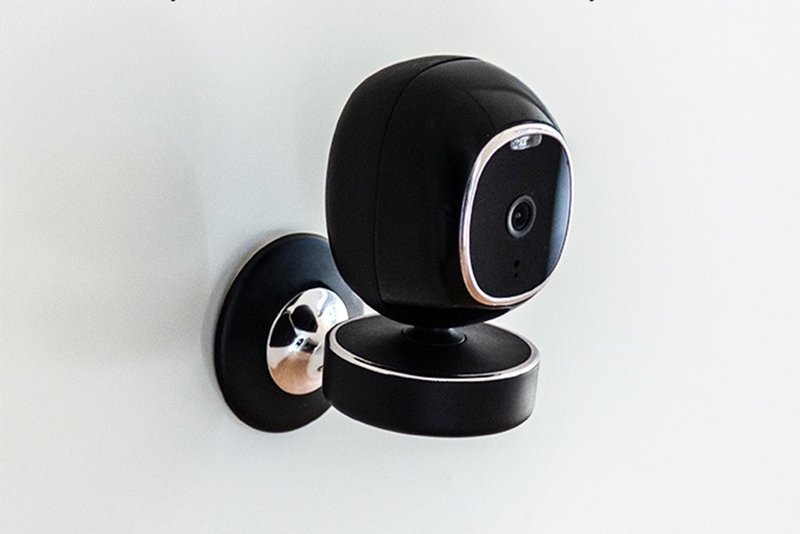 The camera comes with a base for indoor use and a wall mount for either indoor or outdoor use. The company also offers an optional gimbal that enables it to pan 360 degrees. The included power cable extension will come in handy for outdoor installations if there’s no conveniently located exterior electrical outlet. Once the camera is plugged in, you’ll need to download the SimCam companion app (available for Android and iOS) and create an account. The app requires you to register with your mobile phone number, rather than a user name or email address, and the company will then send an SMS with an authorization code to that number. You’ll provide that code to the app to complete the account setup. From there, the app prompts you through the steps of adding a camera and connecting to your Wi-Fi network. Once you refresh the camera list (the app supports multiple SimCams), you’ll see your newly added camera. Tapping it launches the camera’s home screen with the live-feed pane at the top. A toolbar below this has controls for viewing alerts, activating the camera’s privacy feature, turning person detection on and off, and accessing the camera settings. At the bottom is another set of controls for viewing a list of all your connected cameras, their events and recordings, and for accessing your account settings. The SimCam’s image is sharp and clear with no discernible fish-eye distortion despite its wide-angle lens. Color and contrast were strong with the default settings, but you can adjust these and other features in the app. The SimCam responds vocally with a reassuring “settings success” after each tweak. When you’re viewing the live stream, the app provides several more controls in an overlay. These include a push-to-talk button for activating the camera’s mic, buttons for manually recording video or taking a snapshot, a speaker mute, and buttons for object detection and activity zones. If you have the gimbal, touching the screen also activates left and right pan controls. The SimCam was pretty accurate recognizing human activity right from the get-go. Pet detection was more hit and miss. While it would occasionally recognize my dog, it often misidentified my cats as dogs, and in one instance thought one of my kids was a canine. Here, as with the since-discontinued Lighthouse we reviewed a while back, pet detection proves to be trickier than person detection, though presumably it will become more accurate with continued use. Facial detection will be more important for most users, though, and it worked well after some training. To “teach” the SimCam who is part of your household, you must first import up to four photos of each person. The app allows you to upload photos directly from your phone, or you can take fresh pictures using its camera. You then name them and identify their role: father, mother, baby, and so on. Once you’ve added these “trusted faces,” you can tell the camera to notify you when it sees them. The video demo on the SimCam Kickstarter page depicts this as being instantaneous, but in reality I had to use the camera for some time before it recognized my mug and welcomed me home. Even then, it struggled to recognize known persons every time they appeared on camera. Object detection was the most reliable of the AI features in my testing. 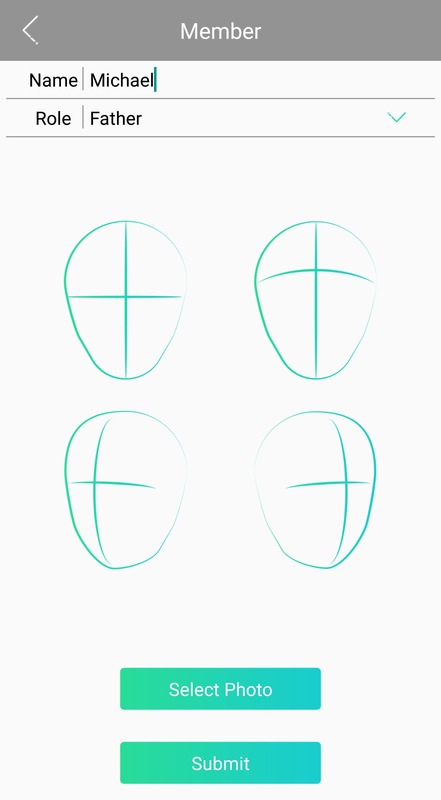 To monitor an object, you draw a bounding box around it in the live feed. When your selection is complete, the object will appear with a red box around it in the live feed. Then the SimCam alerts you when the object moves. 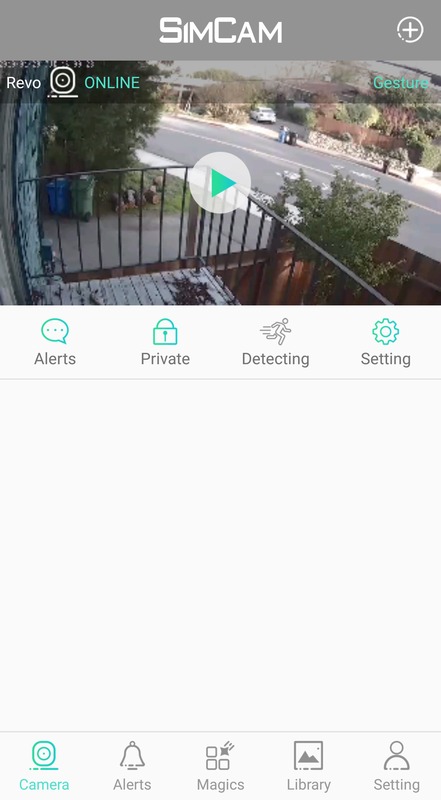 You can use this feature to keep tabs on valuables in your home, but I found it most useful for monitoring the gate into my yard. SimCam promptly pushed me an alert and recorded a video clip anytime the gate was opened. SimCam also supports action detection, though this was the toughest to use and evaluate. It requires you to download skills it calls “Magics” in the app, and then apply them to classifications such as pets, elders, and children. Ostensibly, these allow the camera to recognize when a person or pet smiles, waves, or does something else endearing. But the implementation, which requires you to download and then activate each of three skills—Dog, Smile, and Gesture— feels clunky and non-intuitive. I enabled all three magics, but the accuracy was spotty. It recognized when I waved and a robot voice would declare “It’s magic!” But it did the same when I merely moved the camera from one spot to another. I never did get it to acknowledge a smile, even though I tried until my cheeks were sore. With so much detection happening, the SimCam is bound to be capturing a lot of video. Fortunately, the app keeps a tidy history of clips. The library displays each date- and time-stamped clip in reverse chronological order. You can also filter them by camera, detection type, or date. It’s worth noting that the SimCam includes seven seconds of pre-buffer footage in each video clip, as well as eight seconds of activity after the triggering event. 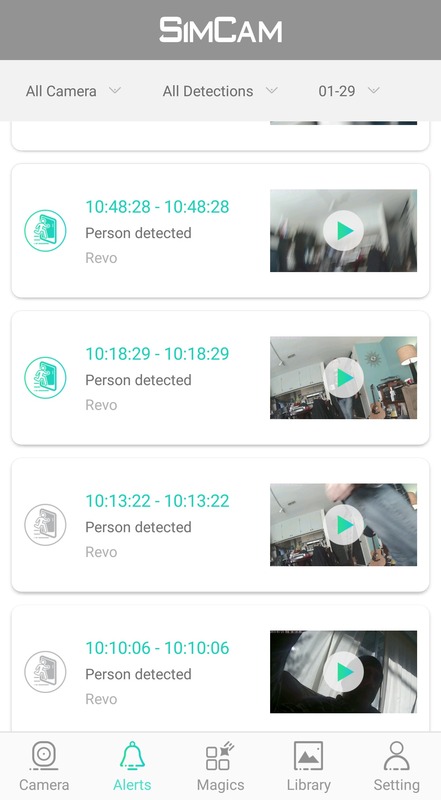 This allows you to see what happens immediately before and after the activity that triggered the recording, which could provide more informative forensic evidence in the event of of crime. The SimCam’s hardware delivered top-notch performance, but it’s AI was a mixed bag. Person detection significantly reduced the number of spurious alerts triggered by trees, animals, and other moving things. Object detection also worked consistently well. But Pet detection, facial recognition, and activity detection were all temperamental. It’s still early days for SimCam, though, and firmware and software updates will likely work out some of the kinks. But you’ll need to decide if you want to pay today for features that might not be delivered until later. Some other manufacturers—including Hanwha Techwin and Oooma—are delivering pretty smart security cameras today and for less money. SimCam’s VPU has the potential to outsmart them, but it’s not there yet. The SimCam brings advanced AI features to modest budgets, but its manufacturer needs to work out some bugs.